Taipei 101 held a shareholder meeting where it appointed new board members as well as chose Chou Te-yu to become the chairman. Ting Hsin group, one of the major shareholders in Taipei 101, has caused discontent over its involvement in the tainted oil scandal, leading to a protest outside the shareholder meeting. Protestors are asking the Finance Ministry to block Ting Hsin’s sale of Taipei 101 shares. The People’s Democratic Front protested outside a Taipei 101 shareholder meeting where a new board of directors was chosen. 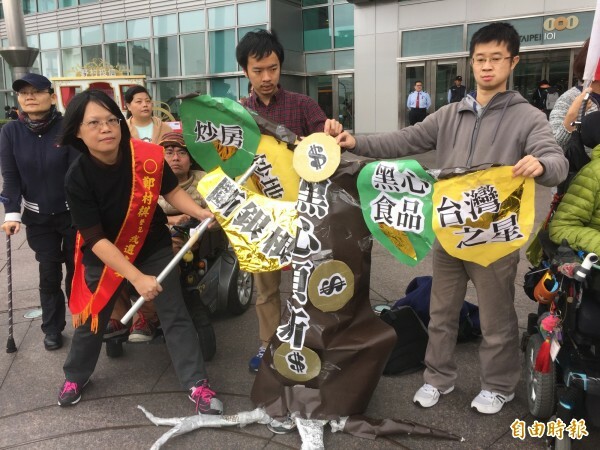 Protesters were upset with Ting Hsin’s planned shareholding sale. How can they stop the IOI Group purchase last year and now they say they can’t block the Blackstone Group? Ting Hsin has yet to compensate many for damages involvement in the tainted oil scandal. The company is now rushing to sell its 37 percent shareholding in Taipei 101. The sale is expected to involve the Blackstone Group, with Ting Hsin potentially earning NT$20bn in profits. We shouldn’t just boycott their products we should cut off their ties to banks. We should call on all government-held banks not to make new loans to this group. While protests continued outside the shareholders meeting, Taipei 101 President Chou Te-you officially took over as chairman. Also, public shareholders took 7 board positions and 3 supervisory positions while Ting Hsin took 5 board positions and 1 supervisory position. A spokesman for Taipei 101 declined to address any issues related to Ting Hsin today.